Annually, the US Centers for Disease Control and Prevention publishes reports on vaccine coverage in the country. This year, they produced two reports – one describing vaccine coverage for children 19-35 months old, and a second one discussing vaccination coverage for children entering kindergarten. Although vaccine coverage remains quite high across most vaccines and hasn’t changed much over the past few years, there is a bit of troubling news. A tiny, but increasing number of children in the country are not getting some or all of their recommended vaccines as a result of parental refusal to vaccinate their children. In fact, the percentage of children under 2 years old who have received none of the recommended vaccines has quadrupled since 2001. The first study by Holly A Hill, MD Ph.D. et al., published in the Morbidity and Mortality Weekly Report, examine vaccine coverage for Advisory Committee on Immunization Practices (ACIP) recommended vaccines in children born in 2015. There are a few key observations about this data. First, despite the false claims about the MMR vaccine being linked to autism, the vaccine coverage for MMR remains at historically high levels. On the other hand, hepatitis B vaccine coverage, especially at birth, is too low, despite that the fact that these vaccines are important for cancer prevention. Vaccine coverage by state also showed some interesting information – Massachusetts has the highest vaccination rates for children born in 2015 of all states. The City of New York, considered a “state” for the purposes of this study, had the lowest rate. However, it is troubling that, even though the proportion of children who received no vaccines by age 24 months, it has increased from 0.3% for children born in 2001 to 0.9% for children born in 2011 to 1.3% for children born in 2015. This works out to be over 100,000 children born in 2015 who aren’t vaccinated against 14 dangerous and deadly diseases. This is worrisome. Although I do not want to give credit to the anti-vaccine religion for causing this troubling increase in vaccine refusal. The internet is filled with ignorant and scientifically inaccurate information about vaccines. Quora, where individuals can ask questions about almost anything, is filled with individuals asking questions about vaccines in good faith. Although 95% of the answers are scientifically and medically accurate, there are many individuals who use misinformation, ignorance, and outright lies to scare people about vaccines. Eventually, this can lead to the point, where the overall vaccine coverage will drop below the level to maintain the herd effect. At that point, there are insufficient numbers of immunized people to block the spread of an outbreak or epidemic of these vaccine-preventable diseases. On the other hand, the study points out that part of the lack of vaccination may be a result of an ongoing issue with the USA – the lack of universal health insurance, especially for the poor. This study showed that 17.2% of unvaccinated children were uninsured compared to 2.8% of all children. Looking at the data from another direction, over 7% of uninsured children were unvaccinated compared to only 1.0% of children on Medicaid and 0.8% of children on private health insurance. This is one of the great moral failings of the country. However, there really are no reasons why any child in the USA is denied vaccines. The Vaccines for Children Program provides free vaccines for all children in the USA who otherwise have no insurance coverage. The program has saved hundreds of thousands of lives over the past 20 years. A second report, by Jenelle L Mellerson et al. and published in the Morbidity and Mortality Weekly Report, examined vaccine coverage for children entering kindergarten in 2017. The good news is that, despite somewhat lower vaccination rates in states like DC, Idaho, and Colorado, the overall vaccine coverage for the major vaccines is well over 90% for kindergartners. The researchers found that the exemption rate was low, about 2.2%. Unfortunately, it was the third consecutive school year that a slight increase noted. The 2.2% exemption rate during the 2017-18 school year was up from 2.0% in 2016-17, and 1.9% in 2015-16. The study does not provide a breakdown between medical (where there is a valid medical reason to not vaccinate a child with one or more vaccines) and non-medical exemptions. The non-medical exemptions, often called “personal belief” exemptions are simply refusing to vaccinate a child because of a variety of reasons – religious (no religion is opposed to vaccines) or because “we don’t like vaccines.” Most exemptions are of the non-medical variety. Only a few states disallow these personal belief exemptions – California, Mississippi, and West Virginia. Unsurprisingly, California and Mississippi have the lowest non-medical exemption rates in the USA, at less than 0.1%. Unfortunately, California has an issue where unethical physicians are giving out (or even selling) non-medical exemptions for parents who want to put their children in danger of vaccine-preventable diseases. These two studies show us two dangerous trends – first, too many very young children are going unvaccinated because of parental ignorance or lack of health insurance. And second, too many parents are putting their children at risk of vaccine-preventable diseases by requesting non-medical exemptions. However, despite the pseudoscientific lies of the hysterical anti-vaccine religion, nearly 95% of children are vaccinated before they enter school. Unlike the anti-vaccine zealots, who seem to dismiss a few thousand cases of cancer or deaths from measles as unimportant or trivial, most of us on the pro-science side of vaccines want all children protected from dangerous and deadly diseases. That’s why we fight to make sure every single child is vaccinated. Why aren’t you making sure that your children are protected from vaccine-preventable diseases? Hill HA, Elam-Evans LD, Yankey D, Singleton JA, Kang Y. Vaccination Coverage Among Children Aged 19-35 Months – United States, 2017. MMWR Morb Mortal Wkly Rep. 2018 Oct 12;67(40):1123-1128. doi: 10.15585/mmwr.mm6740a4. PubMed PMID: 30307907. Mellerson JL, Maxwell CB, Knighton CL, Kriss JL, Seither R, Black CL. Vaccination Coverage for Selected Vaccines and Exemption Rates Among Children in Kindergarten – United States, 2017-18 School Year. MMWR Morb Mortal Wkly Rep. 2018 Oct 12;67(40):1115-1122. doi: 10.15585/mmwr.mm6740a3. PubMed PMID: 30307904. If you break your arm, go to an emergency department, you see that medicine has an effect. Your fracture is set (very painful), and then you have a cast (very itchy). You can observe, without much bias, that a physician and his medical knowledge has fixed you. And you can show everyone else your cast, get it signed, and tell everyone how brave you were! On the other hand, vaccinations can seem like they really don’t do anything. We get vaccinated, and it keeps us healthy–but it’s really hard to see that it does anything. Basically, vaccines maintain your default standard of health (at least what you think is the standard), so showing off your post-vaccination bandage doesn’t have the same effect. The cause and effect is just not there. But there are real stories of tragedies for adults and children who aren’t vaccinated. 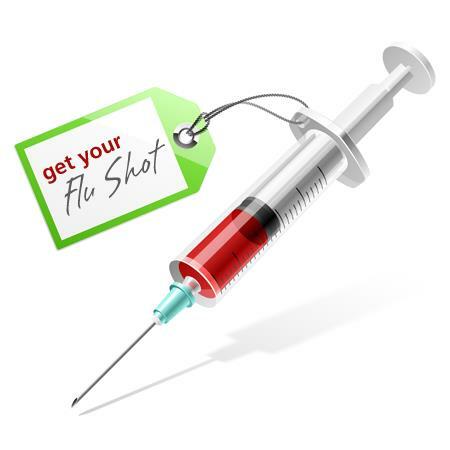 For example, there is one vaccine that seems to be ignored or outright avoided, even by seemingly rational people who get vaccines for everything else–the flu vaccine. 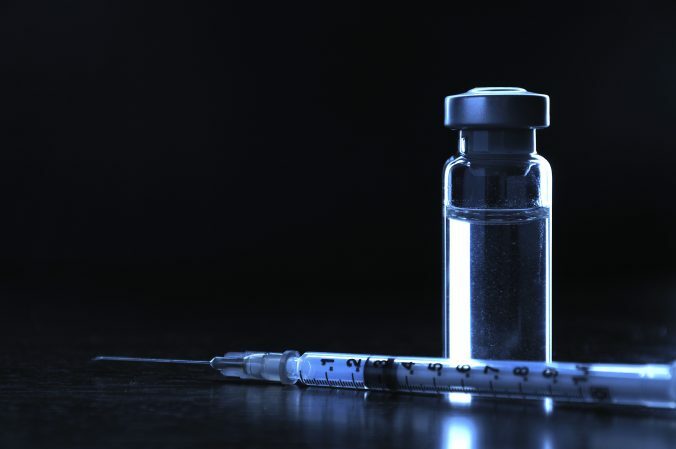 Many people seem to invent myths about this vaccine, or accept those myths more readily than they do for other vaccines, all of which are easily dismissed and debunked. 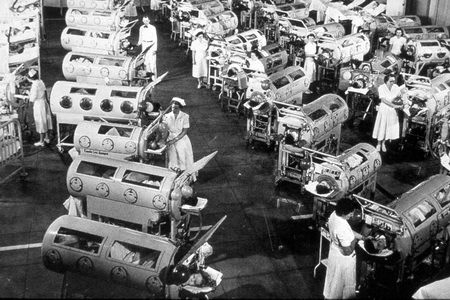 If we don’t vaccinate, wards of iron lungs. As you may be aware, there was a relatively large measles outbreak in New York City (pdf), hitting 26 individuals according to the New York City Department of Health. Some have stated that the outbreak was small, but compared to the historical average of around 60 measles cases per year for the whole United States, and when it was thought that we had “defeated” measles in the USA, 26 is a surprisingly large number. New York City also had a 2011-12 outbreak of whooping cough (Bordetella pertussis), which was infecting individuals at nearly 4X the historical rate. In light of these outbreaks, the New York State Department of Health (DOH) announced that it has updated its immunization requirements for school attendance to meet the revised standards recently published by Advisory Committee on Immunization Practices (ACIP), which is a group of medical and public health experts that have developed vaccine and immunization recommendations to reduce the incidence and prevent disease amongst America’s children. The goal of these recommendations is to reduce the incidence of vaccine preventable diseases. The new 2014 standards did not add any new vaccines for school entry; however, they did update the number of doses required and the minimum intervals between doses. Generally, ACIP makes several recommendations a year, and state health departments “catch up” with the newest recommendations when they set the standard for the upcoming school year. The new requirements, which apply to daycare, head start, nursery, pre-kindergarten and grades kindergarten through 12, represent the best evidence and data available to public health researchers, and is the first update to the New York State requirements in over a decade. For all other required vaccines, students in day care, head start, nursery, pre-kindergarten and grades kindergarten through 12 will be required to have age-appropriate doses in accordance with the ACIP schedule (pdf). A student who is in process is defined as one who has had the first dose of vaccine in all of the required immunization series and has appointments to complete the series in accordance with the ACIP catch up schedule. Medical exemptions to immunizations must be reissued annually. The written exemption must identify the immunization exempted, the medical contraindication for the exemption, and the length of time the immunization is contraindicated. A sample medical exemption form is available one the website. 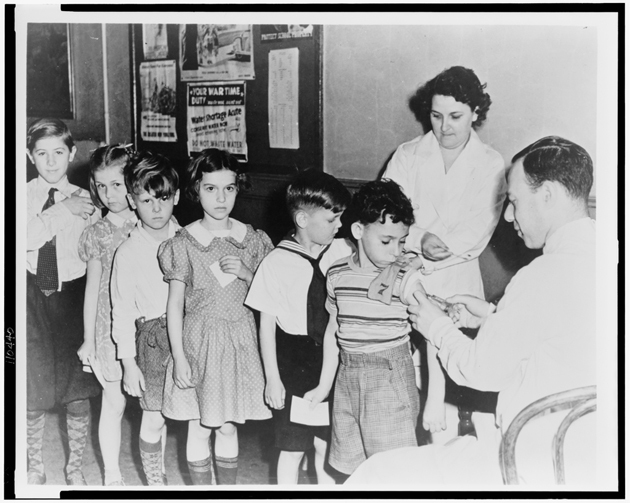 Line of New York City children receiving vaccines during World War II. New York State and City allow for legitimate medical exemptions to some or all of these vaccines, but they require certification and renewal each year. The state and city also allow religious exemptions, but recent court decisions (also here) have empowered school administrators to restrict or disallow those exemptions. I cannot be sure that the New York State Department of Health was responding to outbreaks of measles and whooping cough to re-examine its vaccine requirements, but it would make sense. And hopefully it, along with the reduction or elimination of nonsense religious exemptions (there are simply no legitimate anti-vaccine religious groups), will reduce or eliminate outbreaks of vaccine preventable disease. 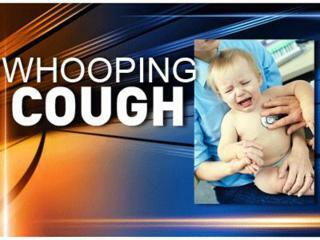 The North Carolina Department of Health and Human Services reported that a three-week old child died of whooping cough (Bordetella pertussis) last week. As the report states, a child cannot be vaccinated with DTaP (the vaccine for diphtheria, tetanus and pertussis) until they are about 2 months old. 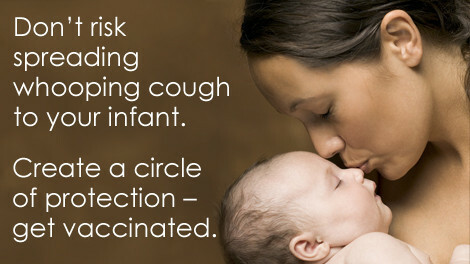 However, because infants are susceptible to whooping cough, all adults, children, friends, relatives, everyone, who is in contact with that child should be vaccinated against pertussis, a process called cocooning. When an antivaccination militant says “my unvaccinated child won’t hurt your child”, this is where their lies are uncovered. For example, an unvaccinated older child may have whooping cough, and the parent take him or her to a pediatrician for the horrible cough, and that infected child passes it to other children.